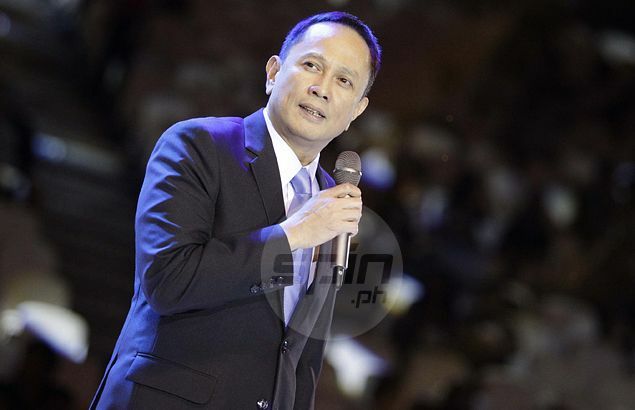 PBA commissioner Chito Salud is set to step down as head of Asia's first professional basketball league, multiple sources told Spin.ph on Friday. Salud, 52, is set to make the announcement on Sunday to mark the end of a nearly five-year reign that saw the pro league reach unprecedented growth in terms of membership and gate attendance. Multiple sources have also told Spin.ph that Salud has already started advising all the team owners of his decision to step down, meeting them one by one since two weeks ago. A person very close to Salud also said there was no 'outside pressure' to resign for the lawyer chieftain, who, he added, has stayed in the position longer than he had planned. Salud, the eighth commissioner of the league and son of former league chief Rudy Salud, wants to devote more time to his family, added the source who debunked talk that he plans to aspire for public office. "Wala (nag-pressure na mag-resign siya). Talagang 'yung timetable niya for himself is four years (as commissioner), sobra-sobra na nga siya," said the source. Two team owners confirmed to Spin.ph Salud's plan to resign, although they expressed hope that he could still be convinced to stay on. "Nagulat nga kami ni (business partner) Raymund (Yu). Kasi hindi namin ini-expect na 'yun ang sasabihin niya. Two weeks ago pa niya sinabi sa amin. Di kami nagsasalita kasi umaasa kami na magbabago pa isip niya," said Terry Que, co-owner of Rain or Shine. "Sana between now and Sunday, magbago pa isip niya," said Que. However, information filtering out of the PBA Commissioner's Office said Salud may make the announcement as early as Friday after news of his plan to resign broke out earlier than anticipated. Blackwater Elite team owner Dioceldo Sy also expressed shock over the development. "I was shocked. It's the last thing I wanted to hear. He's been doing his job very well. The PBA will not be where it is now, if not for the guidance of Chito," said Sy, who was in Singapore when reached by Spin.ph. "Well I felt bad that Chito is leaving PBA, he has done a lot to league for the last five years. It's going to be tough to get somebody to replace him with that high caliber and credibility," he added. Salud took over at a critical juncture in PBA history in August 2010 when the league was struggling to maintain its stature as the most popular league in the country. He will be stepping down at a time when the league is enjoying an all-time high of 12 franchises, a stable television coverage by TV5, and record gate attendance that hit its peak when more than 50,000 fans watched the opening of the 2014-2015 season at the Philippine Arena in Bulacan.